RSVP strives to offer quality kitchen products and cooking tools at competitive prices. 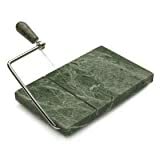 Our Green Marble Cheese Slicer is a perfect example. An elegant way to slice and serve a variety of cheeses. Ideally sized for most cheeses, it measures 5-inches by 8-inches. Use it at your next wine and cheese party or just pamper yourself and enjoy it for everyday use. The stainless steel wire cutter makes perfect slices every time. Our clever design allows the wire to pass completely through the cheese into the groove below. Comes with 2 replacement wires. Replacement wires are also available separately. When all the right people, and ingredients, kitchen tools, and food come together, we call this The Art of Gathering.